PayPal, money order/cashiers check, or personal check. Shipping Buyer pays for all shipping costs. Seller ships internationally (worldwide). 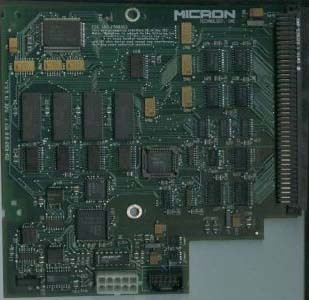 This auction is for a Micron Xceed Color 30 video adapter for the Macintosh SE/30. With this card you can drive an external color monitor in addition to the internal monitor. This card also has the connector for the internal grayscale adapter which will enable your SE/30 to have grayscale on the internal monitor instead of just black and white (you cannot have grayscale internally and color externally at the same time). Please reference the page listed below for a wealth of information on these adapters. The adapter in this auction is the Color 30 which is third from the top in the list of adapters. The card has been tested and works great for driving the external color monitor - internal grayscale has not been tested because I do not have the other part to the adapter. >Shipping is fixed at $6.00 for insured shipping within the continental United States. Other destinations will require that the winning bidder pay actual shipping costs including insurance. I'm starting this auction at $100.00 because I'd prefer to keep it for my own use if I can't get at least that for it. Buy it now is set at $250.00 just in case someone just has to have it NOW! :). Thanks for looking, please email with questions. Hi everybody - just an FYI. There was a grayscale adapter posted just today (8 June) so if one had this card that I'm auctioning and the adapter they would have the full ability to get internal grayscale on the SE/30. The auction number is 2735146031. Remember that earlier bids of the same amount take precedence. Bid Retraction and Cancellation History: There are no bid retractions or cancellations.